Travel to Greece II (level B1-B2). A journey in twenty four Greek cities, which were chosen mostly based on their name, as part of an alphabet game, but also based on further characteristics that will interest foreign students (Athens, Veria, Gythio, Delphi, Epidavros, Zakynthos etc). Information about these cities, myths, stories and songs are intertwined with grammar, exercises, vocabulary and communicational situations that students of this level should be familiar with. You can have a look of the material by pressing here. Travel to Greece III (level C1-C2). A journey in cities throughout the world, where the Greek element used to exist, or still exists, cities which welcomed Greek immigrants and became centers for the Greek diaspora or were, at some point, Greek settlements. Cultural images and historical facts are combined with useful communicational situations, with complex grammatical phenomena and with a more demanding vocabulary. You speak Greek already (level A1-A2). The colloquial words – mostly of Greek origin – that can be found in many languages and the habit of many teachers to use them during the first lessons with a beginner’s class as a motivation for their students, was what became the basis for “You speak Greek already”. Our main goal was to systematize this method, by turning it into a pleasant, interesting and creative educational manual. I sing in Greek (level B1-B2). A song can be an object of various activities and a driving force in learning Modern Greek, vocabulary and grammar. At the same time it presents the history and mentality of the Greek people as well as their stand on different events. “I sing in Greek” includes 52 songs of various categories (traditional, Cretan, wedding songs, social, of islands, rebetika etc), texts with folklore or historical elements of the songs, with their composers or lyric-writers, with the musical instruments that accompany them etc. A passage from Ancient to Modern Greek. This book is aimed at students and alumni of classical schools and also at anyone who is interested, abroad and in Greece as well, in learning Modern Greek and already has some basic knowledge of the ancient language. It focuses on teaching grammatical phenomena and vocabulary of Modern Greek, which is approached in comparison to Ancient Greek, while it also includes many exercises to practice and revise. You can have a look of the material by pressing here. Business Greek (level B1-B2). The book’s main priority is to provide students with an extensive list of specific, business-related communication situations, focusing especially on the necessary vocabulary and the required grammatical and syntactical structures that constitute these situations. It develops their language skills in various contexts, such as a visit to a bank and various transactions, the office environment and e-commerce, making exchange and reading financial newspapers etc. Scientific Greek (level B1-B2). It is a book for foreign scientists, who wish to stay and work or resume theirstudies in Greece, by making a first step: getting in touch with some basic rules of the Greek language and a first sample of vocabulary of their science. It includes special vocabulary and terminology about mathematics, physics, chemistry, geology, biology and informatics. 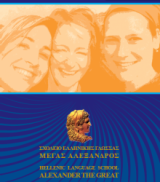 We can provide Free Educational Material in Organizations or Schools of Greek Language to foreigners. Please, contact us.